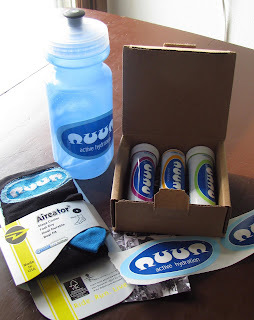 I won a nuun hydration giveaway over at Mom vs Marathon and it arrived the other day so I am ready to give it a go. The UPS driver gave it to my son Jupiter to take inside and he came bounding in to hand me the box. My son Jupiter is 8 years old and has autism. 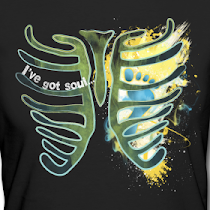 He is nonverbal. This was a pretty cool thing for him to interact with the UPS driver and then bring the box in to me. I opened it to find a bottle, a pair of socks that are way too small, (will turn into a giveaway at some point!) 3 flavors of nuun tabs and a couple of stickers that the littles promptly stuck to their shirts. I like the shape of the bottle as it fits nicely in my hand and it fits into the cup holder on my treadmill! I was really pleased with the berry flavor and it had just a hint of effervescence. I ran for 11.5 miles and it kept me well hydrated and I started to really like the flavor even though it was different than the super sweet stuff I usually drink. 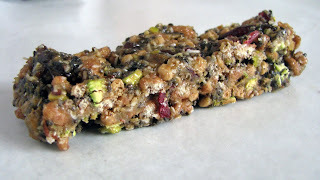 In other news I made energy bars last night that do not turn me into a raging lunatic! I must say it is fun and I find a great deal of satisfaction working within the limitations of gluten intolerance. I have goals and sense of purpose in taking charge of what I put into my body. Anyways, It is a bit too sweet but very tasty otherwise. With the last attempt I took loads of photos and was going to do a fancy elaborate post but after the first attempt being a huge flop, well learning experience, lasting 2 days in discomfort I sort of lost my zeal for it so I decided to just post the recipe and a photo! Here is the recipe, you can't screw it up! In a large bowl, throw in these ingredients Emeril style cuz its fun. a large handful each of raisins, dates, craisins and pistachios. In the last batch I added cinnamon, ground cloves and ground ginger. I forgot to add them this time but will try to remember for next time! I think chocolate chips or cacao nibs would be wonderful too! I mixed all the ingredients together in the large bowl and then pressed it into a baking dish lined with wax paper about one inch thick. I put it in the freezer for a couple of hours to harden up. I am also storing them in the freezer. After a couple of hours I took it out and cut into serving size pieces and wrapped individually in wax paper and taped shut. I tried to eat a bar at mile 7 and found that I had to slow down to eat and breathe at the same time! Its tricky and something I will have to practice doing. I got a bit of a stomach ache at about mile 8.25 but I think it was more from digesting while running rather than what in particular I was digesting. I ended pretty strong and ate another one after wards and felt pretty good. Between choking up and crying a bit when Claire had her baby on Lost and trying to eat and run, I am surprised I didn't turn blue and fall off the damn thing! All in all a good test run for both. Congrats on winning the Nuun! I am always so nervous to try "drinks" beyond water. I guess now is the time to try it...before I get into a 'race' situation! Eeeek! Wow! that's some NUUN giveaway! I was already to shut down for nite nite and my 10k tomorrow when i saw the pic on your blog so just had to say, i love using NUUNs. In fact i just put my lil' pill pack next to my h2o bottle for tomorrow pre race;-) i like the citrus fruit. the bars look great! the remind me of the kind Ive been doing and in those you can't screw them up either....cereal or oats, coconut, some syrup or agave, seeds, nuts, etc mix and freeze and slice. Yours look so pretty and colorful, great!! Thanks for the Nuun review as it is totally foreign to me. So cool Jupiter interacted with the UPS guy too! I've had bars on the brain lately as well as a honking big bag of chia seeds delivered yesterday--will definitely give these a try! I've not run long enough to need to eat during my runs yet but I'm totally dreading needing to haha. Also Awesome job on your eleven miler Angie!! I hope the nuun works for you. I love the stuff. I think your energy bars sound yummy....love koala crisp, so it should make for good bars! Sounds like a fun weekend and a good run. This is my first visit to your site. The site name caught my attention. 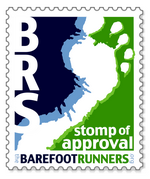 Just today I wrote a post about my husband's return to barefoot running. I'll visit your site more often so that I can share your insight with him. I hope you enjoy the nuun. I like it because it replenishes the salt that I lose from sweating so much, specially during summer runs. It's easy on my tummy too. Thanks for sharing the recipe for the energy bar. It sounds yummy! Those energy bars look great, I'm going to try that recipe! I once tried Nuun and I didn't have the best experience but I will try it again. It was so bubbly and I wasn't expecting that! Glad you finally found something that will work. I can't run and do anything at the same time! So glad you found something that worked. I haven't tried any form of energy bar yet but want to. Thanks for all the great ideas!